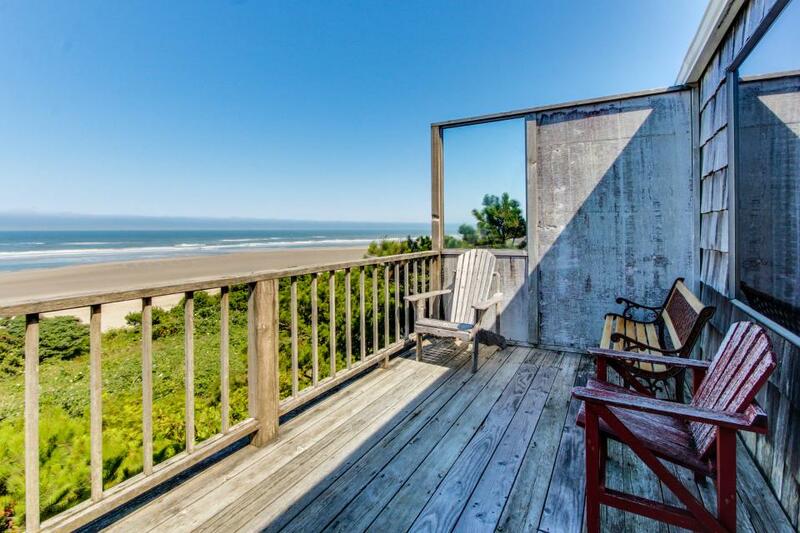 Find yourself right on the ocean by staying at Waldport's Cape Cod Cottages, located on Big Stump Beach! This two-bedroom vacation rental has plenty of space for you and your family to relax and provides a pleasant setting for your next getaway. Waldport is the ideal town for those who enjoy natural and serene beaches, yet prefer not to be too far from town. Big Stump Beach features natural tide pools, perfect spots for fish, crabbing, or clamming, as well as the Big Stump itself - an ancient redwood stump that has existed on this beach before it was ever a beach. Check out this mysterious landmark for yourself, because you'll be just a short walk away. This rustic retreat has a spacious living room complete with cable and a flatscreen TV, a comfortable sofa that turns into a sofa bed, and sliding glass doors leading out to an oceanfront deck. For added convenience, this home has complimentary WiFi so staying in touch with friends back home is simple. Head into the kitchen to find an eating area with room for 4 and a full kitchen equipped with a stove, microwave, refrigerator, and a coffeemaker. When it's time to rest after a long day on the beach, there are two bedrooms to choose from. The first floor bedroom has a queen-sized bed, and the bedroom upstairs has one queen bed and a full. In addition, this cottage has two full bathrooms, one upstairs and one downstairs. Altogether, this home sleeps eight guests. You can even bring up to two family dogs, for a $10 per night per pet fee (with a $40 minimum per stay). Ideal for the family looking for an oceanfront getaway, this Cape Cod Cottage rental offers simple yet comfortable accommodations. You'll love having easy access to the water, so even if you need to head back to your cottage to whip up a quick lunch, you can easily get back to beach fun. Go ahead and take a few days off of work, because the Waldport beaches await!